My name is Margarita van der Velden. I was born in Buenos Aires in 1956, but have lived in the The Netherlands for a long time now. After completing my education at the Royal Academy of Art in The Hague (1980-1984) I founded my own graphic design studio under the name of VeldWerk in 1985. 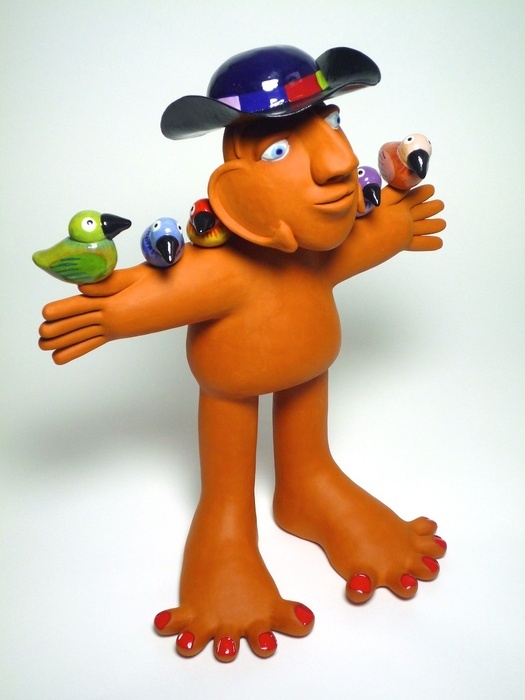 In the year 2007, I ended my career as graphic designer and became a full-time sculptor. From an early age, I have been curious as why things are the way they are. My quest for answers has led me down a path of spirituality. Along the way, it became clear to me that I was looking for answers to questions regarding not only the world around me, but my own existence as well. Through different spiritual philosophies, amongst which Buddhism, I came into contact with Shamanism. From the ancient knowledge and traditions of shamans I have learned and experienced first hand that my view of the world is influenced by events from the past and convictions acquired along the way. By letting go of the past and these convictions, the realization dawned on me that my view of the world is a reflection of my own inner reality. Through my art, I hope to let others experience my inner reality by allowing them to view the world through my eyes. 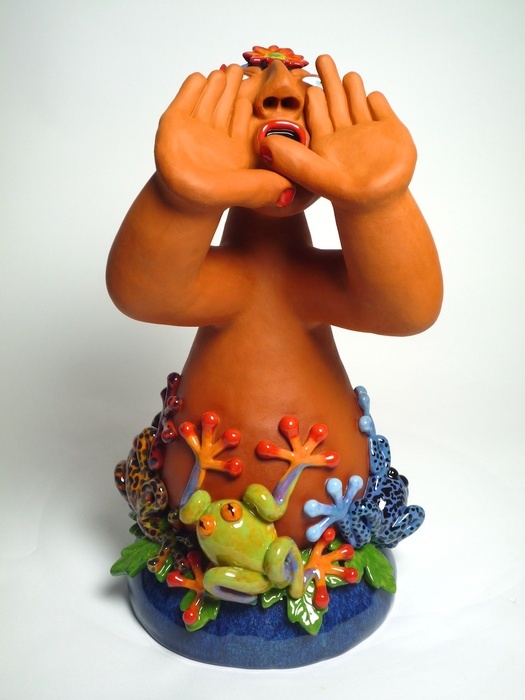 By shaping my thoughts in clay and colorful glazes, in a light and humorous way, I try to let the viewer see the intrinsic beauty of life. 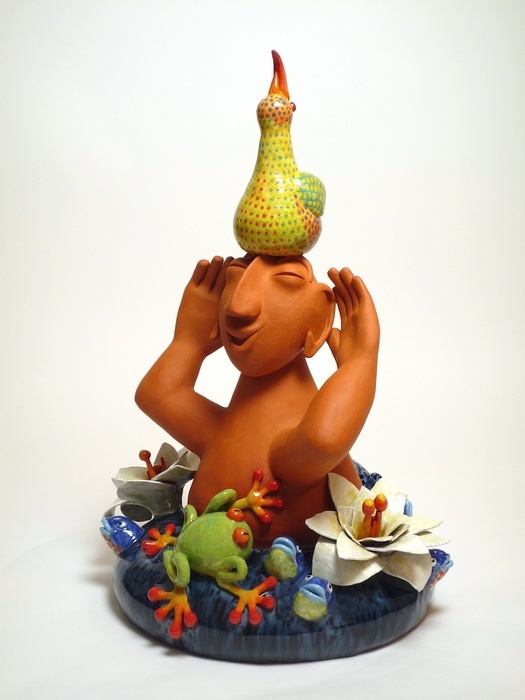 In exchange for their attention, I hope my sculptures will bring the viewer love and joy. I try to show the beauty of the world and instill a positive and loving appeal in everything I produce. 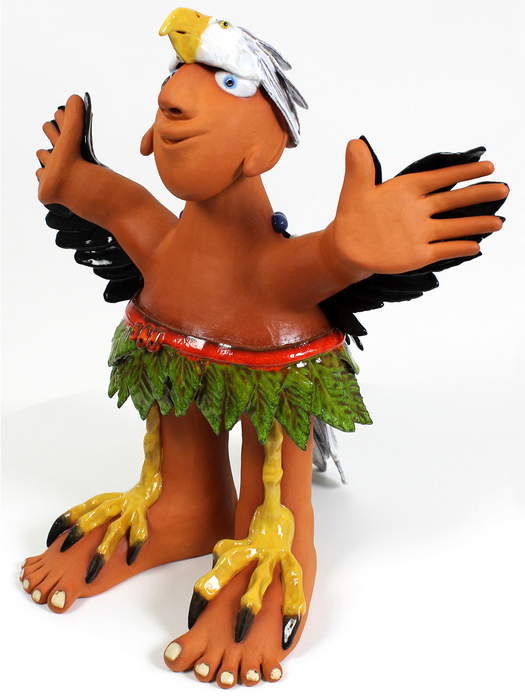 It is my hope that my sculptures will bring a smile to someone’s face; to let them experience, even for a moment, how special and beautiful life really is. In Shamanism, the world’s oldest healing tradition, the animal guides are known as power animals. Shaman practitioners receive a specific animal spirit guide from the spirit world that travels with them to offer insight, guidance and help them with their duties. They honer the wisdom and knowledge that each different animal imparts. The illusion that we can control everything continues to fascinate me. Our negative thoughts can imprison us and rob us of a moment of joy. 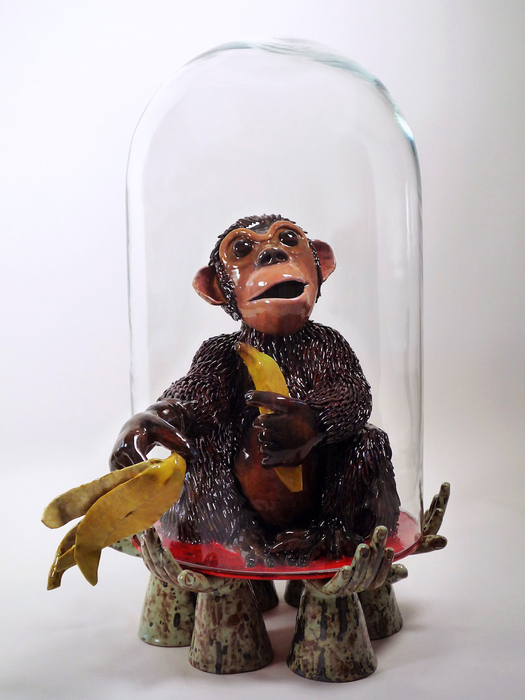 With a bit of humor, we can look beyond our limitations like the monkey in the bell jar. 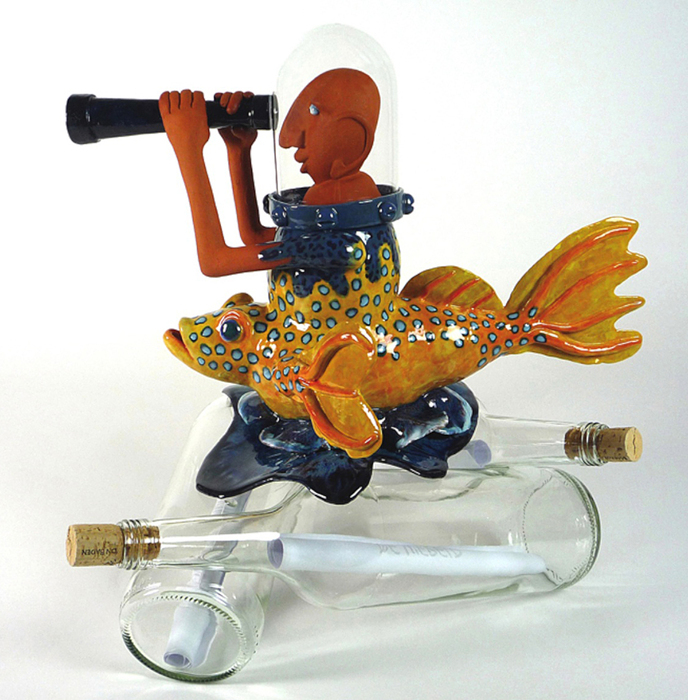 There are three promises in the sculpture Message in a Bottle. These are promises that many of us make to help create a beautiful and loving world. 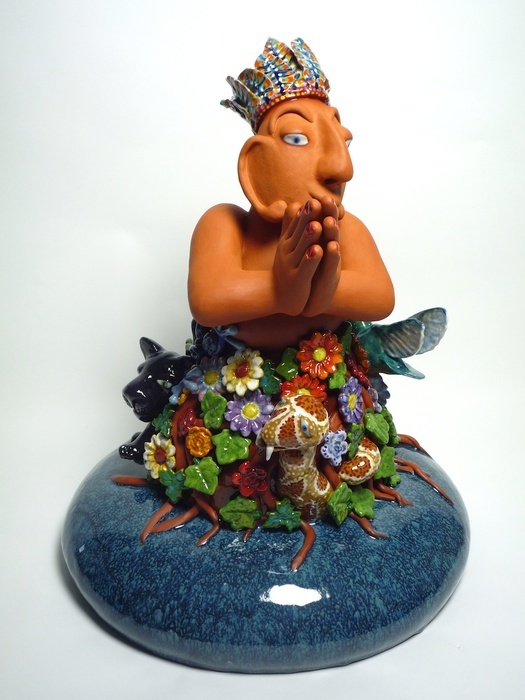 This artwork symbolizes the relationship I have with Mother Earth. We are born upon her, she provides us with food, protection, love and after we have passed we are buried in her soil, or scattered across her fields. 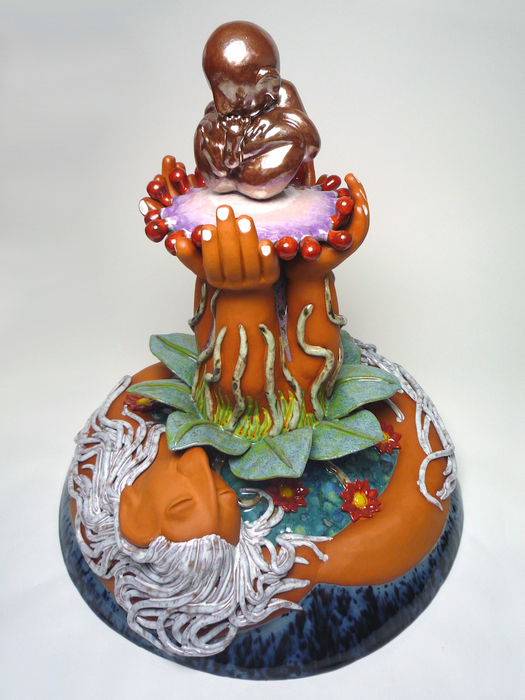 This piece symbolizes the cycle of life on earth. The earth loves us unconditionally, regardless of the destructive influence of mankind. Without her life cannot exist. She is our Mother Earth! By closing your eyes you become a much more attentive listener to everything happening around you. It can even make you aware of all life surrounding you and let you experience that everything is moving. One of the hardest things in life is to listen. How often do we hear the real message? The sculpture Listening Between the Lines symbolizes the feeling, common to all of us, that our messages are sometimes not really understood. At those times, you’d want to shout it out, so that they would really listen. During winter, the life of a bird is hard. With pleasure I ensure that the birds in my garden are at least well fed during this season. My inspiration for Love Birds is my love for them. In return for our care during winter, we can enjoy their magnificent colours and their sweet song all year round. A moment of silence. Patience and faith are always rewarded. 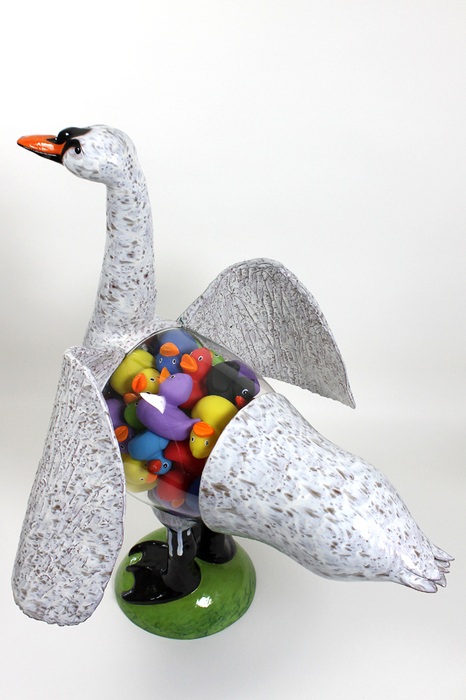 With this sculpture I played with the idea "How an ugly duckling became a beautiful Swan. Inspiration: (“The ugly duckling”, The fairytales and stories of Hans Christian Andersen).